Visit the Alabama State Parks for your Memorial Day vacation. Each and every year the Memorial Day weekend kicks off our Summer season. Value, nature, convenience, and memories are just a few things that we have to offer. Come see us and bring a friend. 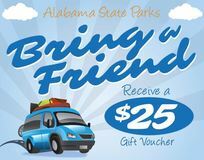 You are invited to "Bring a Friend" to one of Alabama's 22 state parks. Doing so will save you money on lodging the next time each of you visit. From April 1 through July 31, 2015, when you bring a new customer to a state park and each of you rent a campsite or stay in another overnight facility within the park, you will each receive a $25 voucher to use during a future visit. Hey Dad, can we go camping for Memorial Day? If that answer is yes, then choose an Alabama State Park campground as your destination. 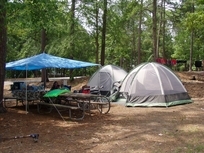 Most Alabama State Parks host modern campsites along with primitive camping. Modern bathhouses and spacious camping pads - many right on the water - make camping in an Alabama State Park comfortable and fun. Why just "go to the park" when you can stay at the park? 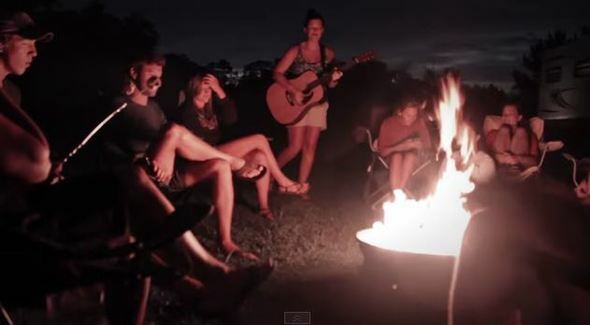 Alabama State Parks offer comfortable lodging options for every style and budget. Whether it's cabins, cottages, chalets or lodge rooms the Alabama State Parks provide you and your family with top-quality facilities including all the amenities you expect with unmatched hospitality. Fishing at an Alabama State Park offers something for both the freshwater and saltwater angler. Our lakes, rivers and streams are home to a variety of species. At our Gulf State Park, you will find excitement in landing the big one from the pier or right from the beach. For something a little different check out the fly fishing at DeSoto State Park. Our Earl Stone designed golf courses are scenic, challenging and affordable. The next time you hit the links give the Alabama State Parks golf courses a try. Our new online booking tool makes it easy to book and play. Our Park adventures are activities geared to put more excitement in your vacation.We offer the following adventures and are excited to offer more in the future. 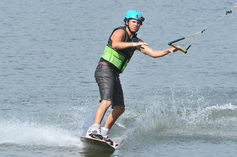 Check out the newest addition to alapark.com. 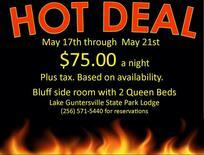 The Last Minute Deals section features random specials on our overnight accommodations system wide. Most of these deals will be posted on Thursdays. Get em while they're hot! We encourage all of our supporters to keep up with the latest on the Alabama State Parks funding crisis. Please continue to express your opinions to your community and your elected officials. This video is a great tribute to our interpretive programs and what the nature centers mean to the kids. Our park naturalists do an outstanding job of sharing nature knowledge. Don't forget to load up and visit an Alabama State Park for National Kids To Park Day this Saturday, May 16th. It's a great way to create lasting family memories.